Appearance: Natsuki has dark black hair with just a tint of blue shade. It's long, silky, and smooth. She has red-hued eyes, courtesy of her father, and soft features from her mother. Her body build isn't much to look at; apparently puberty is taking a long time to finish its job. Marie's height is slightly below average for her age (5'3"), which gives her a petite sort of look. As far as her clothing goes, Natsuki wears the standard uniform of her school: black dress shoes, black knee stalkings, the grayish-green sleeveless one-piece dress, and the long-sleeved sailor jacket. In her travelling pack are also a few pairs of clothes: jean capris, sleeveless tube top, shorts, and a regular tee-shirt, as well as a pair of running shoes. Her hair is usually done up in a pony-tail or left alone; Natsuki's parents had loved her long hair and so she let it grow in remembrance of them. Personality: Natsuki is a whirlwind of emotions. Usually she's approachable and very warm, but if something happens to upset or throw her off Natsuki closes off her emotions and facial expressions. Around new people she's cordial, at best, but she can also be downright vicious if something about the person ticks her off. Most of the time Natsuki can also be found brooding about whatever she's currently having trouble with or about the past. Background: The day Natsuki was brought into the world, she was born in the bustling metropolis of Saffron City. Because of having seen the Gym Leader battle Natsuki was enamored with Psychic type Pokemon and dreamed of catching some of her own. Unfortunately, with restrictive parents Natsuki wasn't allowed to have a Pokemon until she turned sixteen, and they hoped her to have a non-dangerous job like a Pokemon Breeder or a musician. 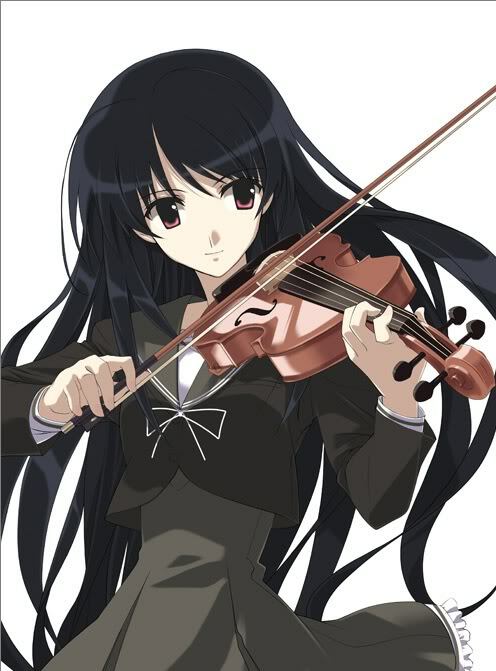 And so Natsuki was sent to attend regular schooling, where mostly everyone teased her about not having a Pokemon, and became quite a violin player. One day though, Natsuki lost her parents in a tragic accident. And now lives with her uncle and his wife along with their sixteen-year old son, Aaron. They were great people and raised her well. Despite losing her interest in becoming a Pokemon Trainer, Natsuki resolved to become a nurse to both Pokemon and people (or something related in that nature). In a stroke of luck (or maybe something else) her cousin Aaron managed to get the amount needed to buy a Dratini, who he had given to Natsuki as a birthday present. With her new Pokemon in hand Natsuki packed up her things and decided to travel the world if only to expand her knowledge in medicine as well as aiding those in need.